Gasp shock horror more often than not I don’t wear a wedding ring and for the most part I have received maybe one or two questions over the years regarding it and only one person who seemed to think that I had committed a great travesty, the irony of who that person is still makes me want to roll on the floor with laughter but anyhoo. Personally I just don’t see what the big deal is, I get terrible eczema on my hands when I am stressed I also have the unfortunacy of having hands and feet that swell terribly in the heat so whilst my rings are relatively loose in the winter there are often times I struggle to remove them in the Summer. That aside I have just never seen what the big deal is in fact when my hubby and I got married I ordered a ring out of a honey catalogue at the last minute it really didn’t faze me, I had a picture in my head of what I wanted and I never found it so just shrugged my shoulders and moved on, my mom later gave me my grans eternity ring and I loved it so much that on the occasion where I do wear a ring that is the one I wear. My father never wore his ring because he was a mechanical engineer and was forever working on a bike or a car so it made no sense and I don’t expect my hubby to wear his either. At the end of the day I am no less married without a ring, a ring is a symbol yes but at the end of the day it doesn’t make a difference to your marriage status, some people think why wouldn’t you wear it are you trying to give off the idea of being unmarried, uhm no a person who wants to appear unmarried can very easily temporarily remove their ring and lie and then pop it back on so that to all they seem happily married. 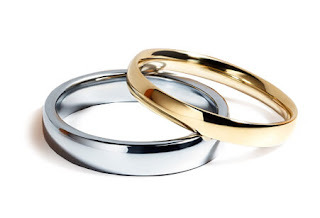 I love my husband I don’t need to wear a ring to prove this fact and I don’t owe it to anyone to wear it to prove in their eyes that I have a solid marriage, many people are unhappy in their marriages and will still wear their ring. At the end of the day it really is a personal preference, I love my rings (engagement and ‘wedding’) and I will wear them out or when I want to but if I run out the door I’m not going to drive all the way home because I am without it and I'm not going to stress if I don't wear it for a few days or a week, am I the only one who feels this way or are there other ladies out there who feel the same? How do you feel about the wearing of rings between you and your partner is it important to you and why?